Why can't we have more 16:10 action? That's a familiar refrain over here at PC Format towers. Obviously we don't get out much, but there's a serious point to be made. 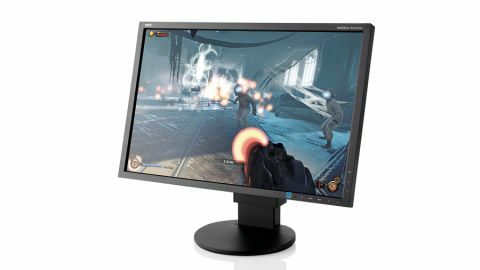 16:9 has taken over the PC monitor market not because it's better, but because it's cheaper. The result is that 1,920 x 1,080 or Full HD has become the default resolution for anything up to 24 inches. That's fine for smaller displays where it represents a step up from, say, 1,680 by 1,050 on a 16:10 22-incher. But for larger 23 and 24-inch panels, 1,920 x 1,200 used to be the norm. The extra 120 vertical pixels don't sound like very much, but they give you vital additional breathing space for things like web pages and Word documents. You spend less time scrolling about the place and there are no discernible drawbacks to worry about. With all that in mind, may we give a warm welcome to the NEC EA244WMi. It's a traditional 16:10 aspect 24-inch panel in a world of 16:9 upstarts. But is it the real 8-bit deal? In other words, can it do those 16.7 million colours natively and without dithering? NEC doesn't say, but our guess is that it's a 6-bit-plus-dithering panel. We reckon that because the NEC EA244WMi has the tell-tale characteristics we're used to seeing with an e-IPS rather than s-IPS or AH-IPS panel. That means the whites tend to look just ever so slightly on the sludgy and grey side, and we can detect the faintest whiff of the dreaded IPS glow. To be clear, this is by no means a bad monitor. It has a nice, smooth anti-glare coating, there's absolutely no edge bleed and the colours are jolly nice. The viewing angles are great too, and black levels are very good, notwithstanding that hint of IPS glow we mentioned. The pixel response and lag levels are also gaming-friendly. NEC has provided a pixel overdrive option in the OSD. It definitely sharpens things up a little in terms of response, but also introduces a spot of inverse ghosting. Still, itfs your choice whether you enable it. Then there are the chassis and stand to consider. The latter is fully adjustable, and both feel reassuringly robust and sturdy. NEC has also included a 'human' (think motion) sensor within the bezel that can detect when you've pottered off to make yourself another coffee, and will power down the screen to save you electricity and money. And it actually works. Put it all together and you have a very solid package, yet we struggled to completely warm to the EA244WMi. The problem is the slight dullness to the overall image quality. It's a fairly accurate display, just not a hugely vibrant one. That's a problem that's compounded by a slight coarseness to the pixel pitch. It's a bit ironic considering our long-term clamouring for 16:10 displays, but 1,920 x 1,200 on a 24-inch panel actually results in fairly big pixels, so there's a general lack of sharpness and clarity to go along with the slight dullness. Yup, we're hard task masters. But for nearly £300, we were hoping for something special. This isn't quite it.